One of the central barrios in Seville is called La Alameda. At the heart of La Alameda is the magnificent avenue called La Alameda de Hércules, so named because of the two tall columns with statues of Hercules on them. It was in the vicinity of this avenue where so much flamenco activity occurred during the first half of the 20th century. From left at the back: Tomás Torre, the son of Manuel Torre; Manolo de Huelva; Cayetano Ordóñez ‘Niño de la Palma’; Antonio Pérez, El Niño Gloria. 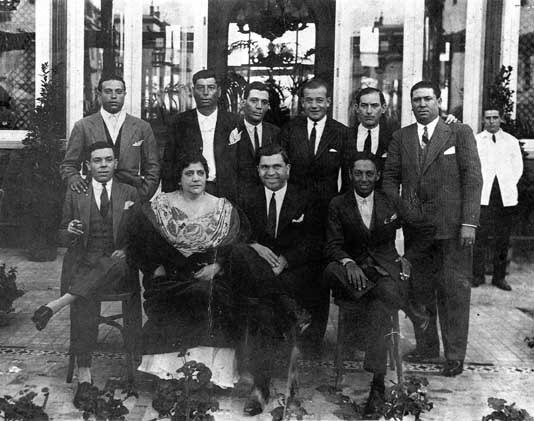 Seated from left: Labioburra; La Malena; Mazaco; Currito de la Geroma. The photograph was taken in the Pasaje del Duque, Seville, c.1920. Donn Pohren wrote a fascinating article about La Alameda de Hércules, Part IV of his series called La Epoca Dorada, which was published in Spanish in Candil, the flamenco magazine of the Peña Flamenca de Jaén, Enero–Febrero, 1995. Although Candil is no longer in publication, there is a Candil Blogspot which gives access to ‘Las mejores entrevistas y artículos publicados en la revista de flamenco Candil, editada por la Peña Flamenca de Jaén a partir de 1978‘. This article was also published in English in Flamenco International magazine, January–March 1998.